Objective: To describe how the tobacco industry used the “accommodation” message to mount an aggressive and effective worldwide campaign to recruit hospitality associations, such as restaurant associations, to serve as the tobacco industry's surrogate in fighting against smoke-free environments. The industry adopted two main approaches to address the problem of declining social acceptability of smoking: attacking the science demonstrating that second hand smoke was dangerous 2,14,24–33 (as it had done with active smoking) and working to change the public's perception of smoking in public. The industry's original defence against restrictions on smoking (creation of non-smoking sections) in the 1970s was to invoke arguments about “courtesy,” “choice”, and “freedom” as well as to claim that any limitations on smoking would hurt businesses that restricted smoking (without mentioning the fact that tobacco industry sales and profits would suffer).1,18,19,34 In the 1980s they also began to promote ventilation as a solution.35 This argument eventually lost credibility because a consensus developed that workers should not be forced to breathe the toxic chemicals in second hand smoke, and business saw no need to install expensive ventilation systems (that would not solve the problem anyway).36,37 In addition, many employers (particularly large employers) independently concluded that smoke-free workplaces were good for business. The tobacco industry, knowing that it has no public credibility, has a well established practice of speaking through front groups.14,16,18,22,25,41–44 The tobacco industry's campaign has not only been directed at convincing individual restaurants to continue to support smoking, but has had a major institutional element through hospitality organisations. The tobacco industry's use of restaurant associations to protect its interests has only been studied in Massachusetts41 and as it relates to smoke-free measures considered by states' boards of health.45 The industry has used the “accommodation” message to mount an aggressive and effective worldwide campaign to recruit hospitality associations to serve as the tobacco industry's surrogate in fighting against smoke-free environments. We analysed tobacco industry documents publicly available on the internet as a result of litigation in the USA. Documents were accessed between January and November 2001. Search terms included “accommodation”, “restaurant”, “hospitality”, “downunder”, “courtesy”, “ventilation”, “HORECA” (International Association of Hotels, Restaurants and Cafes), “IHA” (International Hotel Association), “HOTREC” (a lobbying office for 12 national restaurant associations in the European Union), and the names of key players and organisations as identified in the initial searches. We did not search documents from the British American Tobacco depository in Guildford, England because of their general lack of availability to the research community.46 While we searched all the industry websites, the majority of documents come from the PM website (www.pmdocs.com), probably because PM was the first tobacco company to promote the accommodation message in the hospitality industry. Figure 1 shows how the tobacco industry developed its strategy to co-opt and manipulate the hospitality industry into opposing smoke-free public places beginning in the 1970s and that the industry's response intensified as more evidence accumulated against second hand smoke. Time line showing developments in the relationship between the tobacco and hospitality industries. Arizona was the first state to pass clean indoor air legislation (in 1973),47 followed by Minnesota in 1975. Although weak by current standards, these early measures marked the beginning of the non-smokers' rights movement in the USA. The first major industry public opposition to smoking restrictions occurred in 1978, when it defeated a proposed California law modelled on the Minnesota Clean Indoor Air Act. Ironically, the provisions to create smoking and non-smoking sections were much weaker than the current accommodation strategy the industry advocates, because it did not couple the creation of separate sections with a ventilation system that would supposedly prevent smoke from moving from the smoking to the non-smoking section. PM, however, disagreed with the Tobacco Institute's decision and began its own version of Operation Downunder in 1989.55,58–61 PM believed that the industry should be proactive in shaping the public smoking debate to preempt attempts to pass smoke-free policies, and created a public relations campaign based on “accommodation”. Eventually, other tobacco companies developed similar programmes. The industry's efforts to use the hospitality industry have two major components. There is a proactive element in the form of an educational campaign, transmitted through national or regional hospitality associations, to familiarise individual restaurateurs and bar owners with the idea of accommodation and convince them that instituting smoke-free policies will harm their business. There is also a reactive element to fight clean indoor air laws. When faced with a specific legislative threat, the tobacco industry will send lobbyists and public relations firms to a specific locality in order to oppose legislative smoke-free proposals and offer accommodation policies as alternatives. If local hospitality and business associations do not cooperate with the tobacco industry, the industry creates its own hospitality organisation to serve as a front group and meet its legislative and strategic needs. In 1989, PM formalised the concepts of tolerance and courtesy into a US public relations campaign called the Accommodation Program. As it developed into a nationwide strategy, this programme built around three core themes: (1) harmony between smokers and non-smokers; (2) smoke-free policies are associated with businesses losses in the hospitality industry; and (3) ventilation removes second hand smoke, allowing smokers and non-smokers to share the same environment. 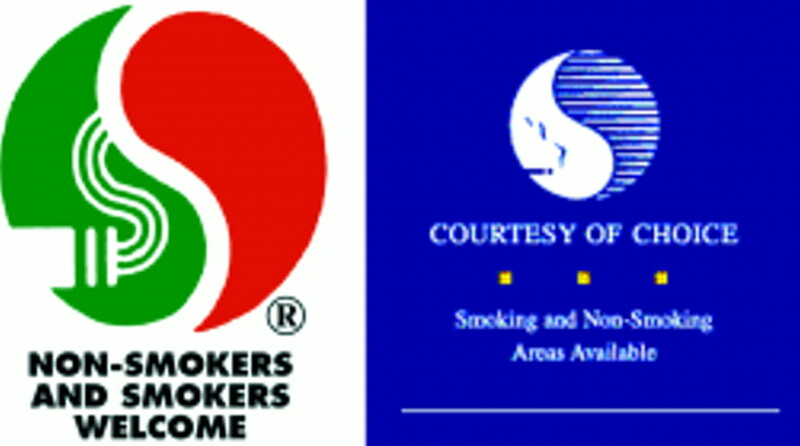 Logos for the original Philip Morris Accommodation Program and the IHA's Courtesy of Choice Program. Since the tobacco industry's initial success in working through restaurants in Beverly Hills, it has rapidly expanded its links to the hospitality industry (table 1) in ways that have been replicated around the world. In some cases, the industry worked with existing groups and in other cases it formed groups to meet its specific political needs. For example, in addition to the BHRA, in California the tobacco industry created the California Business and Restaurant Alliance,40 Sacramento Restaurant and Merchant Association,18,42 and the California Tavern Association18,44 to oppose local and state smoke-free restaurant laws. (In California the tobacco industry had a particular problem because the legitimate state restaurant association, the California Restaurant Association, was supporting a state law making all restaurants and bars smoke-free, largely out of concern for legal liability associated with workers being exposed to second hand smoke.80) In New York, the industry created the Long Island Hospitality Coalition and built the Empire State Restaurant & Tavern Association (which also called itself the United Restaurant, Hotel and Tavern Association, the New York Tavern and Restaurant Association, and the Manhattan Tavern and Restaurant Association) from a small, non-influential group that the tobacco industry infused with cash and used as a front to lobby against local clean indoor air policies and to promote preemptive legislation in the state of New York.44 It was also used to circumvent the lobbying disclosure and spending limits laws in the state. In total, the tobacco industry provides funds to and works with more than 65 hospitality groups around the USA (table 1), including state restaurant associations, and national organisations including the National Restaurant Association,81 the American Beverage Institute, and the National Licensed Beverage Association. The tobacco industry's alliances with the hospitality industry extend worldwide through existing hospitality organisations. In 1989, HORECA (International Association of Hotels, Restaurants and Cafes) published a newsletter with an “Alert” regarding smoking restrictions in restaurants. The “Alert” explained that public smoking restrictions resulted in conflicts at hospitality businesses and often led to the loss of revenue.88 While HORECA is active mainly in Europe, the tobacco industry used the model developed there in other parts of the world, including Latin America and Asia, through the International Hotel Association (IHA, later IH&RA, discussed below). An October 1989 issue of the HORECA newsletter, released as a “special report”, went into detail about the measurement of tobacco smoke, relying on research conducted by Healthy Buildings International,89 a consulting firm the tobacco industry financed to support its political agenda.89–91 The issue promoted the industry position that ventilation was the solution to second hand smoke. Keeping PM's name off the materials also met PM's need to remain in the background and take advantage of HOTREC's seeming independence on the passive smoking issue. “Promote self regulation of accommodating the preferences of smokers and non-smokers on a worldwide network of hoteliers, restauranteurs, and hospitality associations. Establish a framework for self-regulation which enhances customer satisfaction and helps guard against intrusive legislation or regulations . . . The IHR&A website contains a link to the Courtesy of Choice programme page (fig 2). This page displays the yin/yang symbol associated with the US Accommodation Program and the HORECA Preserve Our Traditions programme. It also lists over 50 countries worldwide where the programme is currently operating.116 The 1998 and 1999 IHR&A annual congress reports of the IH&RA acknowledged support from PM Management Corporation,117,118 suggesting that PM sponsorship is continuing. Another variation of the accommodation programme is “Red Light Green Light” laws.119 These laws are introduced to local level policymakers (typically by restaurateurs) in places where citizens are pressing for a 100% smoke-free ordinances. Like the Accommodation Program, “Red Light Green Light” laws only establish minimum restrictions and require signs be posted outside establishments saying whether smoking is allowed inside. These proposals have great appeal to local policymakers who feel pressured to address smoking in public places since these weak laws give the appearance of taking action without having any protective health effect. Introducing “Red Light, Green Light” laws is an industry tactic aimed at delaying and weakening popular smoke-free efforts. For more than a decade the tobacco industry disseminated misinformation asserting that the hospitality industry will suffer financially when smoke-free environments are instituted. Despite the fact that these claims of negative impact are unfounded,10,38,39,46,70,120–122 this argument has been widely accepted in the hospitality business, thanks to the relationship the tobacco industry has established with organisations whose alleged purpose is to protect the interests of businesses in the hospitality sector. This situation creates problems for public health advocates because individual restaurateurs and bar owners, having heard these claims repeatedly from organisations they trust, oppose smoke-free policies out of fear. At the same time that it is promoting a ventilation “solution,” the tobacco industry is careful to avoid claiming that ventilation will resolve the health dangers caused by second hand smoke.126133,134 The PM “Options” website states: “Options, Philip Morris, USA does not purport to address health effects attributed to environmental tobacco smoke.”125 By convincing hospitality businesses to invest in expensive ventilation equipment, the tobacco industry creates a constituency to oppose smoking restrictions. Once the investment is made, hospitality businesses will probably be even more likely to oppose creation of smoke-free environments. The irony is that the tobacco industry has convinced many in the hospitality industry to embrace expensive ventilation systems to avoid non-existent losses in business of going smoke-free. The tobacco industry works to stay out of the public spotlight during any debates over tobacco control policies because of its low credibility. In recent years, the tobacco industry, led by PM, has effectively turned the hospitality industry into its de facto lobbying arm on clean indoor air. Public health advocates need to understand that, with rare exceptions, when they are talking to the organised restaurant associations, they are talking to the tobacco industry, and act accordingly. When public health advocates seek to enact clean indoor air laws, they inevitably find the opposition coming from the hospitality industry rather than the tobacco industry. This paper demonstrates that the tobacco industry has had a worldwide programme to infiltrate and coopt the hospitaility industry to serve the tobacco industry's political needs. Public health advocates, decision makers, and the media should understand that opposition to smoke-free restaurants and bars that appears to come from the hospitality industry is really being orchestrated by the tobacco industry. This work was supported by US National Cancer Institute Grants CA-61021 and CA-87472. Glantz S. Achieving a smokefree society. Circulation1987;76:746–52. The Roper Organization. A study of public attitudes toward cigarette smoking and the tobacco industry in 1978. Tobacco Institute. May 1978. Bates range: PM RECD790406QRH. US Department of Health and Human Services. 9th Report on Carcinogens. Research Triangle Park, North Carolina: USDHHS, Public Health Service, National Toxicology Program; 2000. Pierce J, Gilpin E, Emery S, et al. Tobacco control in California: who's winning the war? An evaluation of the California Tobacco Control Program, 1989-1996. La Jolla, California: University of California, San Diego, 1998. Glantz S. Changes in cigarette consumption, prices, and tobacco industry revenues associated with California's Proposition 99. 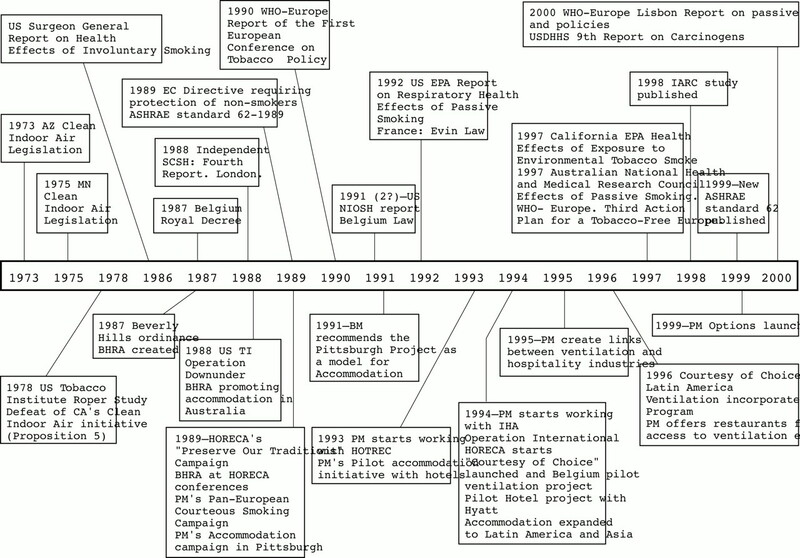 Tobacco Control1993;2:311–14. Glantz S, Smith L. The effect of ordinances requiring smokefree restaurants on restaurant sales [erratum]. Am J Public Health1997;87:1729–30. Manley M, Pierce J, Gilpin E, et al. Impact of the American stop smoking intervention study on cigarette consumption. Tobacco Control1997;6(suppl):S12–16. Fichtenberg C, Glantz SA. Smoke free workplaces substantially reduce smoking: a systematic review. BMJ (in press). Colman R. The economic impact of smoke-free workplaces: an assessment for Nova Scotia. Report. Nova Scotia, Canada: Tobacco Control Unit, Nova Scotia Department of Health, 2001. Pepples E. [California Proposition 5]. Brown & Williamson; 23 January 1979. Brown & Williamson documents, UCSF Library. Access date 30 November 2001. Bates range: document ID: 2302.01 URL: http://www.library.ucsf.edu/tobacco/docs/html/2302.01/index.html. Glantz SA, Balbach ED. Tobacco war: inside the California battles. Berkeley, California: University of California Press, 2000. Glantz SA, Slade J, Bero L, et al. The cigarette papers. Berkeley, California: University of California Press, 1996. Ong E, Glantz S. Tobacco industry efforts subverting International Agency for Research on Cancer's second-hand smoke study. Lancet2000;355:1253–5. Ong E, Glantz S. Constructing “sound science” and “good epidemiology”: tobacco, lawyers, and public relations firms. Am J Public Health2001;91:1749–57. Muggli M, Forster J, Hurt R, et al. The smoke you don't see: uncovering tobacco industry scientific strategies aimed against control of environmental tobacco smoke. Am J Public Health2001;91:1419–23. Hirschhorn N, Aguinaga Bialous S, Shatenstein S. Philip Morris' new scientific initiative: an analysis. Tobacco Control2001;10:247–52. Hirschhorn N. Shameful science:four decades of the German tobacco industry's hidden research on smoking and health. Tobacco Control2000;9:242–7. Drope J, Chapman S. Tobacco industry efforts at discrediting scientific knowledge of environmental tobacco smoke: a review of internal industry documents. J Epidemiol Community Health2001;55:588–94. Bero LA, Glantz SA, Rennie D. Publication bias and public health policy on environmental tobacco smoke. JAMA1994;272:133–6. Bero LA, Galbraith A, Rennie D. Sponsored symposia on environmental tobacco smoke. JAMA1994;271:612–17. Barnes D, Bero L. Industry-funded research and conflict of interest: an analysis of research sponsored by the tobacco industry through the Center for Indoor Air Research. J Health Politic Policy and Law1996;21:515–42. Barnes D, Bero L. Scientific quality of original research articles on environmental tobacco smoke. Tobacco Control1997;6:19–26. Hanauer P. Proposition P: anatomy of a nonsmokers' rights ordinance. NY State J Med1985;85:369–74. Americans for Nonsmokers' Rights Foundation. Don't buy the ventilation Lie. Berkeley, California: Americans for Nonsmokers' Rights Foundation, 2001. Repace J, Lowrey A. An indoor air quality standard for ambient tobacco smoke based on carcinogenic risk. NY State J Med1985;85:381–3. Repace J. Can ventilation control secondhand smoke in the hospitality industry? Bowie, Maryland: Repace Associates, Inc, 2000. Scollo M, Lal A, Glantz S. Why studies of the economic effects of smoke-free policies on the hospitality industry reach different conclusions. BMJ (in press). Ritch W, Begay ME. Strange bedfellows: the history of collaboration between the Massachusetts Restaurant Association and the tobacco industry. Am J Public Health2001;91:598–603. Traynor M, Begay ME, Glantz S. New Tobacco industry strategy to prevent local tobacco control. JAMA1993;270:479–86. Samuels BE, Glantz S. The politics of local tobacco control. JAMA1991;266:2110–17. Dearlove J, Glantz SA. Tobacco industry political influence and tobacco policy making in New York 1983-1999. San Francisco: Institute for Health Policy Studies, University of California San Francisco, 2000. Dearlove JV, Glantz SA. Boards of health as venues for clean indoor air policymaking. Am J Public Health 2002 (in press). Glantz S. Smoke-free restaurant ordianances do not affect restaurant business. Period. J Public Health Mgt Practice 1999;5:vi-ix. Bialous S, Glantz S. Tobacco control in Arizona, 1973-1997. San Francisco: University of California, San Francisco, 1997. Givel M, Glantz S. Tobacco inudstry political power and influence in Florida from 1979 to 1999. San Francisco: Institute for Health Policy Studies, University of California, San Francisco, 1999. Givel M, Glantz S. Tobacco control and direct democracy in Dade County, Florida: future implications for health advocates. J Public Health Policy2000;21:268–95. Smokefree Educational Services. Support for the Smoke Free Air Act (Intro. 232). In: Fogel B, ed. Testimony before the New York City Council. New York: Smokefree Educational Services, 1994. Samuels BE, Begay ME, Russo Hazan A, et al. Philip Morris's failed experiment in Pittsburgh. Journal of Health Politics, Policy and Law1992;17:330–51. Macdonald H, Glantz S. Political realities of statewide smoking legislation: the passage of California's Assembly Bill 13. Tobacco Control1997;6:41–54. Bradshaw J. Taft's veto threat sidetracks measure that would stymie smoking bans. The Columbus Dispatch 16 November 2000; section 01A. Bradshaw J. Bill stalls that would restrict authority to ban smoking. The Columbus Dispatch 17 November 2000; section 07B. Fahey T. Health officials urge smoking ban passage. The Union Leader and New Hampshire Sunday News 27 March 2001. Editor. Is Oregon going up in smoke? Ashland Daily Tidings 2001. Demer L. Group forms against smoking ban, alcohol tax. Anchorage Daily News 11 January 2001. Clanton B. Restaurants to legislature: leave our smokers alone. New Orleans City Business 14 May 2001; section 16. Mintz M. Smoke screen/secondhand money. The Washington Post Magazine 24 March 1996:11–30. Lee C, Glantz SA. The tobacco industry's successful efforts to control tobacco policy making in Switzerland. Report. San Francisco: Institute for Health Policy Studies, University of California, San Francisco, 2001.
International Hotel and Restaurant Association. Creating value through people and partnership. In: 1999 Annual Congress of the International Hotel and Restaurant Association, October 1999. Durban, South Africa: International Hotel and Restaurant Association, 1999.
International Hotel and Restaurant Association. One to one: marketing in the interactive age. In: 36th Annual Congress of the International Hotel and Restaurant Association, October 1998. Manilla, Philippines, 1998. Bartosch W. The economic effect of smoke-free restaurant policies on restaurant businesses in Massachusetts. Journal of Public Health Management Practices1999;5:53–62. Dresser J, Boles S, Lichtenstein E, et al. Multiple impacts of a bar smoking prohibition ordinance in Corvallis, Oregon. Report: Pacific Research Institute, 1999. Huang P, Tobias S, Kohout S, et al. Assessment of the impact of a 100% smoke-free ordinances on restaurant sales – West Lake Hills, Texas, 1992-1994. MMWR Morb Mortal Wkly Rep1995;44:370–2. Philip Morris USA. [Options folder] Access to ventilation consulting. Fact sheet. Silver Spring, Maryland: Philip Morris; 3 August 1999. Philip Morris. Philip Morris Options – who we are. Website: Philip Morris; 2001. http://www.pmoptions.com/DisplayLevel3.asp?topic_id=165 Accessed 3 December 2001. Philip Morris USA. Indoor air quality handbook: ventilation options to help you comfortably accommodate non-smokers and smokers in your establishment. Handbook: Philip Morris; no date. The Hospitality Coalition on Indoor Air Quality. Labor, management, business create unique national hospitality coalition on indoor air quality to serve customers and workers. website: CompuTate; 2001.http://www.hciaq.org/hcpr030201.htm Accessed 3 December 2001. National Licensed Beverage Association. Atmosphere Plus, a licensed beverage industry initiative. website: FORD Management Services, Inc; 2001.http://www.nlba.org/AtmospherePlus.htm Accessed 3 December 2001. The Texas Hospitality Coalition on Indoor Air Quality. Clearing the Air , providing information on clean indoor air for hotels, restaurants and the hospitality industry. website: The Texas Hospitality Coalition on Indoor Air Quality; 2001. http://www.clearingtheair.org/about.html Accessed 5 December 2001. Illinois Hospitality & Commerce Coalition on Indoor Air Quality. The Illinois Hospitality & Commerce Coalition – Members. website: Illinois Hospitality & Commerce Coalition on Indoor Air Quality; 2001.http://www.illinoiscleanair.org/members.htm Accessed 14 November 2001. Colorado Indoor Air Coalition. Improving your indoor air quality could improve your bottom line. Restaurant News of the Rockies November 2001. Corporate Responsibility Consulting Ltd. About AIR. website; 2001.http://www.airinitiative.com/en/1/ahpaap.html Accessed 3 December 2001. Philip Morris. Philip Morris Options – frequently asked questions. Website: Philip Morris; 1999. http://www.pmoptions.com/faq.asp Accessed 14 November 2001. Philip Morris USA. Access to Ventilation Consulting. In: 1999. Australian Hotels Association (WA). AHA – Australian Hotels Association – membership information. website; 2001.http://www.ahawa.asn.au/corporate.shtml Accessed 5 December 2001. Wheeler C. Ottawa group fighting smoking ban denies accepting money. Ottawa Citizen 11 April 2001. Sollars D, Ingram J. Economic impact of the restaurant smoking ban in the city of Boston, Massachusetts. Montgomery, Alabama: The International Society of Restaurant Association Executives; 15 December 1998. No author. Distinguished restauranteurs of North America consumer poll: the public calls for accommodation. Sign of the Times 1999:3. Author unknown. AtmospherePLUS to Freshen Air. The Economist 1999 7 August 1999. Tobacco Institute. The Tobacco Institute 1999 budget state activities division. Tobacco Institute; 16 July 1998. Access date unknown. Bates range: TNWL0004280-4290 URL: www.tobaccoinstitute.com. ANR I004921. Phillips F, Lehigh S. Restaurant group tied to Big Tobacco. The Boston Globe 3 May 1999. Stotz L. Remarks of Larry Stotz, executive director, Michigan Licensed Beverage Association, News Conference, Trippers Sportsbar, Lansing, MI. In. Lansing, Michigan: Michigan Licensed Beverage Association, 1996. Oregon Restaurant Association. Convention 2001. website: Oregon Restaurant Association; 2001.http://www.ora.org/events/events_convention.htm Accessed 5 December 2001. Dillon J. Tobacco firm funding foes of smoking ban. The Times Argus 1993 22 April 1993.